Welcome To A.A. Duckett, Inc. Since 1919 A.A. Duckett, Inc. has established itself as the premier HVAC/R service company in the New Jersey region, providing complete maintenance, repair, operation engineering, design/installation services, and energy solutions. In addition A.A. Duckett, Inc. offers building automation controls, ultra low-temp refrigeration, process piping, plumbing service and back preventer certification. Maintenance can be provided on an on call basis or by full time assignment to your site. A.A. Duckett, Inc. Facility Services Group provides customized mobile building maintenance solutions. 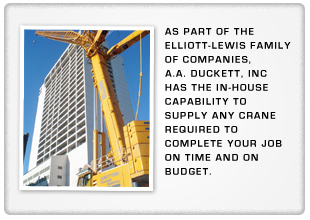 Whatever your mechanical or facilities maintenance needs, A.A. Duckett, Inc. can fulfill them. A.A. Duckett, Inc. recently installed an Aon unit on the roof at Independence Place, a high rise condo building in the Society Hill section of Philadelphia. Go along for the ride as Sautter Crane, an A.A. Duckett, Inc. affiliate, lifts the unit onto the 25 story building via a GoPro camera attached to the Aon unit.